Please note: This page is currently under construction. Baskets, the most developed art of the Central California tribes, can be attributed a tribal affiliation based on an analysis of materials used, weaving techniques, form and style. Although all techniques of coiling and twining were explored, the tightly coiled basket was the most developed. An arid region, including the Mountain regions of the Tehachapi Mountains at the southern end of the San Joaquin (Fort Tajon and the Grapevine) and extending north towards the Kern River and Paiute Mountain and eastward into the low-lands and into western part of the Great Basin. A mix of native peoples populated this area including the Kawaiisu, Panamint, Washoe and Paiute. Most of these peoples lived in small family groups and moved with the seasons, water supply and animal life. Believed to be a small branch of the Chemehuevi (150-500) living just east of Bakersfield in the mountains between the Tehachapi Pass and Piute Mountain, often referred to as Kern Co., Tehachapi, or Caliente Indians; made fine twined and coiled baskets, primarily using white willow, maroon / red Joshua tree (yucca brevifolia) root, black bracken fern root or devil’s claw seed pod husk weft, and whole deer grass stems as bundle foundation warp. Sometimes quill is randomly used in decoration, and rare experimentation with juncus, sedge and redbud is seen. Open bowls, hats, burden baskets, seed beaters, rounded bottom water jars (tus), and various trays were commonly made. Twined basketry involved weaving over and under multiple warps, from 2 to 6, each providing a different pattern. Coiling was to the right, stitches slant left, are on whole stem deer grass which resembles solid rod, but isn’t, and is most often woven with the rows connecting one to the preceding, although, the Kawaiisu also have a coil technique where they only connect the rows with a stitch for every 10 stitches or so…. this being called a “grasshopper-stitch” or an “interrupted stitch”. In normal coiling, the stitches can be very close together, or sometimes are woven with a gap between them which exposes the foundation. Living north of the Kawaiisu, extending from China Lake in the northwestern Mohave Desert, north to the eastern shores of the Owens Lake and extending eastward through Darwin, Panamint Springs, and into and throughout the Death Valley with Furnace Creek being an important site, the Panamint inhabited some of the globes harshest environments. A small tribe (pop. 150 circa 1880) living in off mesquite bean, cactus fruit, rabbit, snake, lizard and other small game, the Panamint made some of the finest and most beautiful baskets which are coveted by collectors today. The traditional baskets such as the twined conical burden basket and the pointed-bottomed pitched tus are identical to those of the Paiute making them indistinguishable. Coiled basketry is coiled to the right; traditional forms include winnowing trays, bowls, storage baskets, bottle neck jars and hats. Fag ends (the beginning of the weft string) are clipped, running ends hidden, the work surface on large cooking baskets are on the inside, and bottleneck jar baskets and small bowls is on the outside. Coiled baskets can use three different types of warp structures: 3 solid rods of willow (sometimes sumac), a single rod and bunch grass bundle, and a bunch-grass bundle without a rod. All baskets have a 3 rod foundation at the rim and the traditional weft materials being white willow (which turns to tan due to oxidation), red Joshua Tree (yucca) root, brownish-black bulrush root, and black devil’s claw. When the tourist market developed after the turn of the century, the Panamint began experimenting with new weft materials and new design elements which they felt would appeal to the “White Collector”. During this period, we find that both bird quill and yellow juncus were added to their weft materials, and that, elaborate animal (birds, rams, lizard’s etc.) and plant (cactus, cactus flowers, trees etc.) designs were particularly popular with weavers living near both Darwin and Furnace Creek. Known for very fine weave and beautiful execution in form and design, Panamint basketry is highly collectible in today's market. With circa 1900 population estimates of 1500, the Paiute are often broken into three subgroups, the Owens Valley Paiute (also known as the Eastern Mono), the Northern Paiute ranging from SE Oregon, into Western Nevada and into East/Central California (which include the Mono Lake Paiute), and the Southern Paiute which include the San Juan Paiute south and west of the Grand Canyon in northwestern Arizona, as well as the groups along of the Colorado River basin and into the Mohave desert. These subgroups have many small bands which cover the large territory. The band of Paiute that lived specifically in the Owens Valley were the only group that had permanent villages as the environment was rich enough to support people year round. Most of the other bands had seasonal migrations in the search for food and shelter. Paiute basketry was diverse and extensive. Twinned baskets were generally utilitarian, such as hats, seed beaters, gathering baskets, parching trays, seed jars and water baskets which were covered with pine pitch. Coiled baskets were always coiled to the left, and are either with 1, 2 or 3 rods of willow for the foundation. Generally speaking, the Northern baskets, and particularly with the Mono Lake baskets, we see the coiled works using redbud and bracken fern root for the red and black materials, with sedge and/or willow as the light material whereas the Owens Valley used willow for the light and bracken fern for the dark, and the Southern using willow and black devils claw with some use of red yucca root. The beaded Paiute baskets are mostly from the Northern groups with both the Mono Lake as well as those groups around Reno being active. During the 1910-1920 period, the Mono Lake Paiute developed striking globular baskets for the “Indian Days” celebrations in Yosemite Park, with weavers such as Lucy Telles, Tina Charlie, Leanna Tom, Carrie Bethel and others earning prize money… and whose baskets on today’s market command some of the highest prices. The Paiute coiled basketry is very diverse in motif placement and treatment, in foundation structure, and has a wide range of quality in terms of weave, balance, and form. The Washoe, whose territory centered at Lake Tahoe and extended on the eastern slopes of the Sierra Nevada mountains into Nevada, extending to Carson City, were noted basket makers, with Washoe Dat-so-la-lee (Louisa Keyser), becoming the most famous of all Native American Basket weavers. Today, very fine coiled baskets by Dat-so-la-lee are often priced between $200,000-1,000,000. 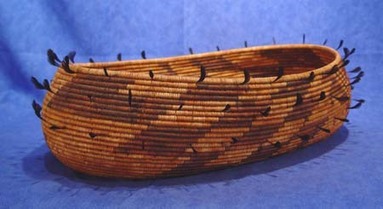 The twined basketry of the Washoe was very similar to the Paiute in technique, form and function. The primary weft was willow (Salix spp. ), used whole or split into rods for warp, with the pealed inner bark of the willow branch used for the weft. Trade with the Miwok brought the redbud for the red weft, and mud dyed bracken fern root were used for the black. “Sun Burned” willow was sometimes used for a soft brown weft. Coiled Washoe baskets are coiled left, and woven on either a single rod or a 3-rod foundation, whereas the rods are placed in a triangular fashion, with the top rod resting on the two lower rods. The weaver attaches one coil to the previous by inserting the awl through the top rod of the finished coil creating a hole for her new sewing material. Rim coils are usually plain, but a diagonal herringbone rim finish (false braided rim) or a “whip stitch” (half braid) finish is sometimes used. Although early Washoe basketry was very similar to the Paiute work, beginning around 1900 and through the 1930s it evolved into more refined forms with artistically executed patterns. During this period, many of the Washoe weavers began weaving for the collectors market and began entering their work into competitions. Weavers such as Dat-so-la-lee took a leading role in setting high standards and she refined the small mouthed rounded give baskets, known as a Degikup, into a basket of perfect proportions and with design that mimics the proportions. The Sierra Nevada mountain range running along the eastern side of California covers a territory approximately 400 miles x 80 miles. The tribes of the region included the Tubatulabal, Monache (Western Mono), Sierra Miwok, and Maidu, with most of villages located on rivers or near lakes. Like most of the Great Basin Tribes, most of the Sierra Nevada tribes were hunter/gatherer people, constantly on the move over their tribal territory. Living just north of the Kawaiisu along the Kern River extending from Lake Isabela north to Mount Whitney, the tribe was estimated at 200-300 persons in 1850. Similar to Kawaiisu basketry, the Tubatulabal often used red yucca root as the dominant color. Plain and diagonal 2 and 3 strand twining using split willow and in both open and closed weaves are seen. Coiled baskets of with grass foundation were coiled to the right, used split willow and/or sedge for the light material, red yucca root (often the dominant weft material) or less frequently seen redbud, black devil’s claw or dyed bulrush root for the weft. The shapes and patterns of the Tubatulabal are similar to the Panamint, with materials and warp structure defining the tribal attribution. The Sierra Nevada crest separates the Mono into 2 primary groups: the Eastern Mono/Owens Valley Paiute/Mono Lake Paiute and the Western Mono known as the Monache. All the Mono are the southwestern branch of the greater Paiute population. Like many of the Central California tribes, the Monache moved seasonally, following game and weather trends. The territory was harsh, only a modest amount of acorn was available, some pine nut. The Monache had at least six separate bands, and their basketry was similar to Foothill Yokuts basketry whom there was significant trade. Plain and 2 strand diagonal twined baskets woven both open and closed include seed beaters, sifters, parching trays, and conical burden baskets. Coiled baskets are coiled to the left (Yokuts coil to the right), and are on a grass foundation. Cooking, mush, storage, winnowing, gaming, and trinket or gift/treasure baskets were common forms and uses. Of special note was the bottleneck basket jar which was usually very finely woven. The light background weft material is of split sedge which has a mottled appearance, going from a light tan to darker tan/brown. Black bracken fern and red redbud with the other primary weft materials. The overall designs of Monache baskets usually favor horizontal banding broken by vertical elements; motif such as “snake” bands of diamonds, zig-zags, dragon fly motif, meander band (flight of the butterfly), etc. are commonly seen. Some diagonal motif is also seen, but generally, the baskets are comparatively more conservative in design than the Yokuts. Rims can be plain or whip stitch. Feathers are seen infrequently. From Yosemite to Placerville in the Sierra’s lived the Sierra Miwok who had three primary divisions, Southern, Central and Northern. Hunter gatherers, with acorn, buckeye, hazelnut, roots, greens, and game, the forage allowed a greater pre-contact population estimated at 6,000-10,000, which was decimated during the “Gold-rush” period. The Miwok like most of the Northern and Central Native populations, were killed or died of European diseases between 1849 and 1900. By 1910 fewer than 700 survived. Twined baskets included seed beaters, conical burden baskets, winnowing trays, open sifters, fish traps, storage baskets etc. The coiled baskets, coiled to the left, were on a grass foundation for the Southern branch as they were influenced by their Yokuts neighbors, and on 1, 2 and a 3 rod of willow foundations in the Central and Northern branches as influenced by their Maidu neighbors. The awl would split the rods which creates a “bundle of split material” look. Bracken fern root and redbud were used as the primary black and red weft materials, with willow used as the light color field material. Baskets tend to have a lower quality of weave, the rod foundations to be less even creating lumpiness, than seen in their neighbors work. Rim finish can be plain, whip, cross, or herringbone. Elements tend to be small and scattered. The Miwok are noted for their repairs of worn baskets often replacing an entire bottom. During the 1910-1920 period, some weavers competed in the Yosemite Indian Days basket competition, and a refinement of their basketry developed to meet the collectors market. Warp Materials: Willow, Sumac and Deer Grass The primary materials used for the warp of California baskets will be willow (Salix lasiandra) and much more rarely, sumac (Rhus trilobata) for the rod baskets, and bunch or deer grass (Muhlenbergia rigens) for the bundle baskets. The willow is usually harvested, split, stored, and then resplit, shaved to size and the softened with water to weave. Sumac was harvested young (1 year), and was shaved to size. Grass was normally used as whole stems. The willow is handled as weft in similar fashion as described under the warp section; the bulrush root can be used either in the natural brownish state, or it can be mud-dyed to darken to a black, and sometime to a very shiny purple/black. The Yucca root is maroon and one can note that it chips, or flakes off fairly easily so it is best to be careful in it’s handling. The black devil’s claw is a seed pod which has a tough outer husk which is pealed, split, soaked and then shaved to size for use. It often has a dusty gray look, and is very fibrous under close inspection. Coil Method: The method of using a bundle of grass, rod and grass, or a 1,2 or 3 rod foundation over which weft was coiled, were all used throughout Central California. Twined Method: The dominant method of weaving utility baskets such as winnowing or parching trays and burden baskets was through twining which is essentially passing weft over and under radiating warp rods. The nature of the twining can vary depending on how many wefts are handled; with two wefts twisting around each warp called “plain twining” and three wefts passing 2 over and 1 under each warp, then alternating, called “three-strand or diagonal twining”. Diagonal twining produces reverse patterns when viewing the baskets interior and exterior. Sometimes a reinforcing horizontal rod, sewn at a right angle to the warps, with a technique called “lattice twining” is seen on baskets. Each Central California basket has a specific purpose and use. Storage: Several forms and sizes of storage baskets were made, from heavy and large to light and delicate; from tightly woven with fitted lids, to open warp baskets which allow air to pass right through the body of the basket. The large baskets usually had a wide base, tall sides with a slightly inward lean near the top. They were often from 1 to 4 foot tall. Burden and Work Baskets: Burden Baskets: These were often large, conical in form, woven both with closed and open warps (closework and openwork), and often suspended or carried in nets and carried on the back. The baskets were held in place with a cordage tumpline extending from the net sides around the head of the carrier. The work hat was usually sparsely decorated; it protected the head and was used to help hold the tumpline in place. Seed Beater: Another common work basket was the seed beater which was an open warp, often spoon shaped basket, sometimes with a reinforced handle, which was used to beat grasses or other plants to knock off the seeds onto a flat, closed warp (closework) basketry tray. Hopper: Another important work basket was the hopper which was a bottomless basket which was placed atop a stone mortar bowl or a flat stone. Placing the acorns on the stone and within the hopper, the worker would hold the basket in place with her legs, and pound the acorns with a heavy stone pestle which would splash the broken acorns upwards, but the hoppers walls catching the splash and redirecting the material back to the stone. A fiber brush would then sweep the acorn flour off the rock and into a large basketry bowl which was placed underneath the stone. Hats: Both fancy (dress or ceremonial) hats and working hats were woven by the women but worn by both men and women. The dress hats normally have a flatter top so that it touches the head only at the rim, whereas the work hats were more dome shaped and were worn tightly to the head. Cooking / Food: Large closework baskets were used to cook acorn meal by placing the meal in water in the basket, and then placing hot stones in the basket to cook the meal. The stones were moved with sticks so they would not burn the basket, and when they cooled, they were removed, placed in a clear water basket to wash off the meal, and then put back into the fire to reheat. Small food bowls, usually about 3” deep and 8” in diameter were for individual meals. Sifting baskets; flat round baskets often with lattice twined reinforced rods on the back side; used to sift acorn flour by tapping the side of the basket with a stick. Trinket or Treasure Baskets: Fancy smaller baskets used to hold something small a valuable. Sometimes given as a gift, and later, when the commercial trade grew, sold to the collector. There was an element of prestige obtained by the weaver to give away something of very high quality, and ones status within the tribal community was heightened through giveaways. A fine basket weaver was also considered by men as a very desirable wife. Gaming Trays and Jump Dance Baskets: Large, highly decorated, flat gaming trays were used to hold the dice or sticks in the various gambling games. Cylindrical baskets, often with painted deer skin coverings on the ends were held by the men in a ceremonial dance called the Jump Dance. Cross-Cultural forms: Napkin Rings, Cup and Saucer, Teapot and many other forms of Anglo influence were made as trade items.